APEXi Suction Intake Kit LEXUS - Dezod Motorsports Inc - Home of the automotive performance enthusiast since 2002. Some manufacturers of performance air filters make aggressive claims about their filter’s ability to make power, but leave out the fact that their filters are not effective at filtering dust and dirt. Consider the wear and tear that will result from insufficient filtration. The Apex Power Intake filter element is engineered to minimize air flow restrictions without compromising its ability to filter contaminants from the induction air stream. We proudly expand the usage of the Power Intake filter element by incorporating it into a line of drop-in, factory-replacement filters. A little TLC for your daily driver. 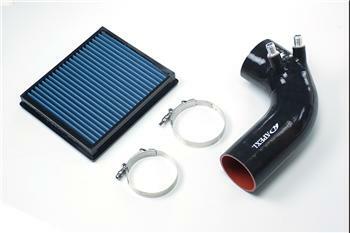 The Power Intake is dry-type filter and is trouble free. Some of the problems associated with wet type cleaners, such as oil sticking to the air flow meter, are a thing of the past. The Power Intake is basically maintenance free. Filter replacement, when necessary, can be done at a very low cost. Filter life has been tested to operate over 25,000km (15,000mi) under normal street driving conditions. Filter maintenance and overall life differs depending upon conditions under which the filter is used. Inspect for wear and tear, use best judgment, and replace if damage is suspected. The filter can be cleaned by blowing compressed air through the filter, opposite the direction of inbound airstream. This filter is designed for use as a dry-type filter. Do not apply filter oil to this filter as it was not designed to utilize such oils. Water, cleaning solvents, and other liquids may damage the filter and must not be used to clean the filter. Silicone Suction Intake Hose- to minimize heat soak and maintain lower intake air temps.